Having seen Andy Key's REMEMOTECH project, I had to have one! To quote from Andy's site, "REMEMOTECH is a modern-day re-implementation of a Memotech MTX/FDX/SDX compatible computer. It implements enough hardware to allow it to run MTX BASIC, various MTX games and CP/M". Cool! (That's not a word I often use!). 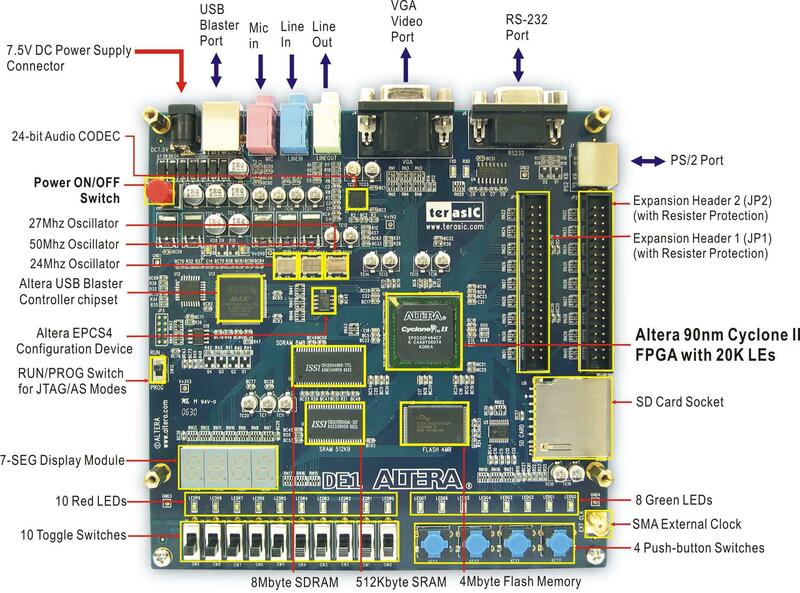 The system runs on an Altera DE1 "Development and Education" FPGA board and offers the exciting prospect of running MTX / CP/M software on real, non-Memotech, hardware. I think the great REMEMOTECH overlay on top of the board might have made my mind up! Comprehensive setup instructions are available on Andy's website, but I thought it might be useful to document realisation of the project from a user's perspective. The notes below describe my implementation of REMEMOTECH using Windows 7. The steps below broadly follow those written by Andy, obviously, any errors or omissions are all mine. Step 1 - "Get an Altera DE1 board"
The Altera web site is in the US, being in the UK, purchases from the US can prove to be comparatively expensive when you include shipping, customs duties and VAT. Although the boards can be sourced from Taiwan, I found that a better alternative for me was to use Digikey UK whose prices include shipping and customs duties (but not VAT). Update 03/07/2012 - Board ordered through Digikey UK. Although there is a "digikey.co.uk" website, I think that the orders just get routed through to the US for processing but the ordering process was easy and the on-line chat feature that I used to ask a question was really fast and helpful. I placed the order late in the day UK time (~ 7:30 pm), forgetting that we're coming up to the US 4th of July holiday, so I'll probably miss the shipping window to get it sent out before the holiday. I'll need to pay the VAT when it arrives, but shipping and customs duties are supposed to be included - I guess that I'll know when UPS delivers it! 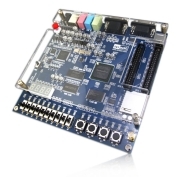 The board was shipped yesterday from Digikey, Thief River Falls, Minnesota. Digikey provided a link to the UPS shipment tracking details which showed that delivery was scheduled for 06/07/2012. (I've saved the UPS tracking details here). Update 05/07/2012 - Delivered, two days door-to-door - not bad at all! Step 2 - "Download & Install Quartus II Web Edition from Altera"
Quartus Web Edition has been updated to Version 12.0 (June 2012). The software is available free and no licensing is required, but you do need to enter your e-mail details, either as a one-time visitor, or you can register with them so that you don't have to re-enter your details if you revisit. The Windows download is 2.6 gigabytes but you can choose to just download the installer which is supposed to reduce the total download size by up to 50%. You can also download the complete ISO for Windows & Linux (5.7 GB). I like to make sure that I retain a copy of any software that I install, so I downloaded the full Windows package. The Installation includes the base Quartus software, plus extensions covering the whole Altera product line. Selecting all products on the installation menu requires 5.9GB of disc space, I chose to install just the software for the Altera DE1 platform, i.e., just the Cyclone II option, this reduced the disc space needed to 4.3 GB. Step 3 - "Get the REMEMOTECH package and unzip it"
As I was still waiting for my board to arrive, I did this in a slightly different order to Andy. I downloaded and extracted the REMEMOTECH zip into a new folder. Step 4 - "Start Quartus and open the rememotech.qpf project"
When I opened up the rememotech.qpf project in Quartus, as the project was created in the previous version of the software, I was given the option to overwrite the database, I chose not to and tried to open the project. There was nothing to indicate the fact the Quartus took this as an instruction not to open the project and it just sat there. There was a lot of HD activity at this time, so I presumed that Quartus was doing something, but I eventually realised that nothing was happening. In order to open the project, you need to OK the overwrite the database prompt and the project opens pretty quickly. "Make yourself a coffee whilst it does its thing. It will spit out lots of warnings, which almost always can be ignored." I noticed that Andy's distribution already contained a compiled project file, so I decided to wait for the board to arrive and download the already compiled project without recompiling. I paid a slight premium for UPS collecting the VAT; on £110.69, the VAT should have been £22.14. The UPS invoice stated that "Duty/VAT charges are estimated", but even I could have estimated 20% of £110.69 closed to £22.14 than the £25.81 that UPS charged! Still, a ~£3 handling charge for collecting the VAT is not unreasonable, so all-in-all, I'm happy with the shopping experience - particularly in the light of the fast delivery. OK - down to business with configuration the DE1 Board . . . . . . . Step 6 - "Use the Programmer tool to download the rememotech.pof file"
[When the power is first turned on, you will see the blue power LED as well as 10 red and 8 green LEDs turn on]. When I first connected the DE1 to a 64 bit Windows 7 PC, the USB driver did not install correctly. I needed to manually install the driver in "c:\altera\12.0\quartus\drivers\usb-blaster". You are then supposed to be able to go into the Programmer and select the "Hardware Setup" button and configure the connection to the programmer, i.e., select the "USB Blaster" cable interface. However, when I selected the "Add Hardware" button in "Hardware Setup", a message box was displayed advising "Attempted to access JTAG server -- internal error code 82 occurred". I eventually found this explained on the Altera website (follow the link for the relevant page), it was caused by having my software firewall and anti-virus running when I installed Quartus which prevented the JTAG server service from running. The fix for this is supposed to be to manually start the JTAG server service without the firewall or anti-virus running. Unfortunately, the service does not appear to have been installed correctly and was not present in the list of services registered on the machine. Quartus is a 32 bit program and I was not sure how well it was going to work under 64 bit Windows 7 and whether some incompatibility may have caused the problem with the installation of the JTAG service. I decided the reinstall Quartus in a Windows XP Mode virtual machine with the firewall and anti-virus program turned off. When I did this, the JTAG server service was listed in the list of services on the virtual machine. When the DE1 is plugged into the PC, you are prompted to enter a location for the USB drivers, again, in my case, this was "c:\altera\12.0\quartus\drivers\usb-blaster". This time, the USB drivers installed successfully and the system reported that the "device was ready to use". I opened Quartus, loaded the "rememotech" project and started the programmer. The Hardware Setup showed "No Hardware", but this time, selecting the "Hardware Setup" button showed that the USB-Blaster was available for selection. Select the USB-Blaster and close the "Hardware Setup" window. The as-shipped "RUN/PROG" switch position on my DE1 was "RUN", select "PROG". The "rememotech.pof" file should be visible in the upper window, select it, and hit the "Start" button. The blue "LOAD" LED should illuminate on the DE1 and the Quartis progress bar should move as the device is programmed, until it reaches "100% (Successful)" and the DE1 "LOAD" LED should go out. As per Andy's web page, the LED display indicated "EEFF" and LED "R7" was ON. I powered off the DE1, connected a VGA monitor and a PS/2 keyboard and repowered the DE1 in "RUN" mode. I had no need to rebuild the flash image, so prepared to write the precompiled flash to SD card. Andy's instructions say "Find a small SD Card (between 512KB and 1GB in size) which will be your "Flash image" SD Card." I didn't think that I had any small cards of that size lying around, so assumed that a larger size would be OK - probably just wasting space. I then wasted a lot of time trying to get the image written to the card and the DE1 to boot successfully. To cut a long story short, there is a maximum size limit on the SD card that you use. I eventually found a 256MB card from an old camera and managed to get the flash written and the DE1 to boot correctly. I normally use "Win32DiskImager", an open source image writer for Windows. (This works very well for writing Debian images for my Raspberry PI.) You can download the program from here. When I was struggling to get the DE1 to read the flash, I tried another couple of utilities, which, once I worked out that I needed to adhere to maximum card size limit, also worked successfully. HDDRawCopy is one example. Anyway, once I did was I was told (!) - as noted on Andy's page, the system booted to the CP/M prompt. This is the first time that I've seen the Memotech CP/M console in colour! - Back in the day, I only had a green screen mono monitor connected to the 80 column board, so it was nice seeing it in colour for the first time. So, there we have it - REMEMOTECH is up and running! Now I just need to get familiar with using it. The next challenge is finding a way to create SD cards on Windows so that I can run the MTX tape & disc images in the REMEMOTECH distribution . . . . .
"Accessing SD cards on Windows"
It might be worth mentioning that I slightly misunderstood what loading the flash image does. When the system boots, it issues a RECONFIG command - "RECONFIG F:52, B:18, C:19", this sets up a RAM disk "F" (which maps to drive A) and drives "B" and "C" which are the first areas on an SD card loaded into the DE1 card reader slot. At this point, drives "B" and "C" are merely "placeholders" - to use these drives, you will need to insert a properly formatted card into the card reader. If you try to access drives "B" and "C" without a properly formatted data card inserted (not the SD card with the flash image), you will get a CP/M error - "Bdos Err On B: Bad Sector". When you expand the REMEMOTECH Zip file, the "firmware" directory also contains two SD card volumes, "sddisc.bin" and "sddisc2.bin". These are obvious candidates for the "B" and "C" drives created when the system reboots. I had a number of problems trying to write these images to SD card under windows. You need to write these files to the start of the SD card. I struggled to do this with SD cards formatted as Windows default FAT/FAT32 volumes. There may be better ways to do it, but I used a utility called Partition Wizard, There is a home edition of this of this tool which is free for home use. I used this tool to remove all formatting and data from the SD card. Update: As Andy has pointed out, you can concatenate the SD images on Windows before writing them to the SD card using the DOS copy command; e.g., "copy /b sddisc.bin+sddisc2.bin both.bin". I have now got both of the disc images copied to a single card can can run the included software and games successfully. REMEMOTECH is now working well and bringing back lots of memories! 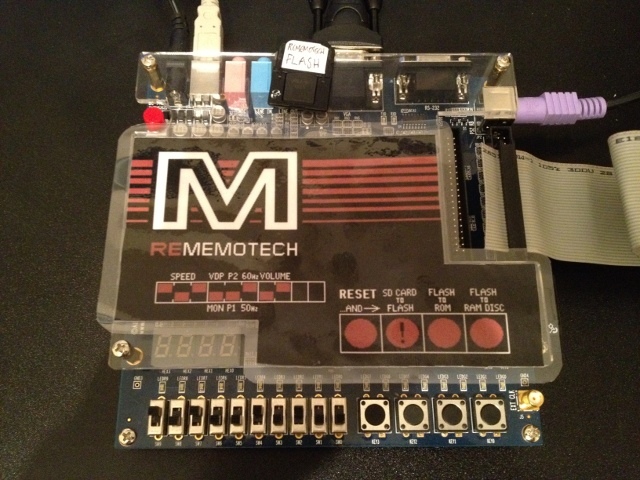 I want to add the ability to display video outputs from the emulated 80 column board and the emulated VDP at the same time as described on the REMEMOTECH Hardware page. Unfortunately, I can't find a VGA breakout board to make up the required connector at this point, but I will keep looking. (The breakout board referenced on Andy's site is currently showing out of stock). REMEMOTECH in it's current form is great, but I got to thinking what might make it even better and thought how much better it would be if it looked and felt more like an MTX512. I'm sure that the few working MTX computers will eventually grind to a halt, when that happens, we will have those great MTX cases consigned to being oversized paper weights or door stops! But what if REMEMOTECH could be installed inside the MTX case to replace the Memotech motherboard? What if the MTX keyboard could be interfaced to the DE1 and additional software added to decode the MTX keyboard codes? I know this would just be delaying the inevitable - my keyboards are definitely showing their age - but maybe a good strip-down and clean would keep them going for a few years longer. I suppose consideration would need to be given to accessing the switches, buttons and flash card, but that should not be too hard. For example. if you leave the two, rear upper, case screws undone, the keyboard hinges up, which would give access to the DE1. Alternatively, maybe the DE1 could be orientated such that the Flash card is aligned with the cartridge port cut-out on the left hand side of the case and the DIP switches replicated on the DE1 GPIO and brought out to a DIP switch package mounted on the keyboard end plate? 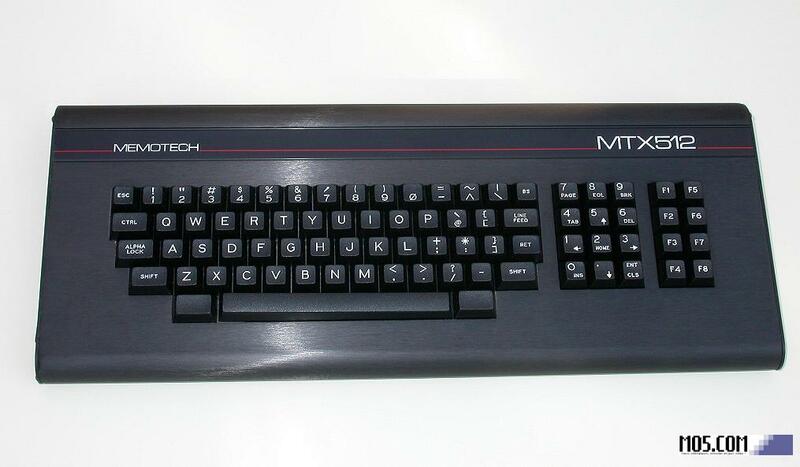 In either case, the original MTX rear plastic moulding would need some extra height added to allow for the extra head height of the DE1 compared to the original motherboard.